Changing demographics are having a substantial impact on college and university student populations. In order to continue garnering funds and supporting their higher education institutions, development offices and individual fundraisers need to learn more about alumni of color. To help move fundraising staff away from a "one size fits all" approach, Engaging Diverse College Alumni provides a comprehensive overview of philanthropy in diverse cultures. Unlike other works on fundraising within communities of color, this book focuses specifically on college and university alumni and offers concrete suggestions for engaging these populations, including best practices as well as approaches to avoid. A Comprehensive Overview of Diverse Cultures—use of secondary sources, interviews, and quantitative data to explore the history, motivations, and trends of Latino, African American, Native American, and Asian American and Pacific Islander communities. Practical Recommendations—data-based recommendations and examples integrated throughout the chapters, including "Strategies at a Glance" for quick reference. Best Practices and Innovative Approaches—interviews with advancement staff and alumni of color, an entire chapter outlining successful innovative fundraising programs, and a chapter on common pitfalls to avoid. 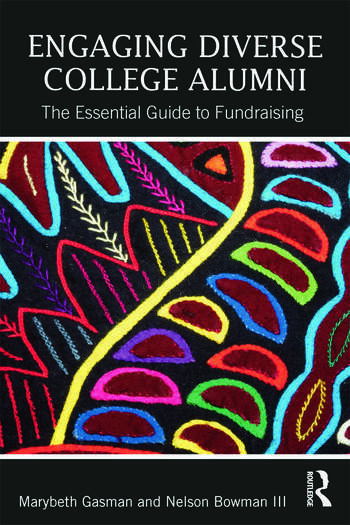 Both newcomers and seasoned fundraising professionals will find this book to be a compelling and in-depth guide to engaging diverse college alumni. Chapter Two: African American Philanthropy and Alumni: "Uplifting the Race"
Chapter Three: Asian American and Pacific Islander Philanthropy and Alumni: "Respect and Prestige"
Chapter Four: Latino Philanthropy and Alumni: "Elevating Culture and Family"
Chapter Five: Native American Philanthropy and Alumni: "Community over Individual"
Marybeth Gasman is Professor of Higher Education in the Graduate School of Education at the University of Pennsylvania, USA. Nelson Bowman III is Executive Director of Development at Prairie View A&M University, USA.